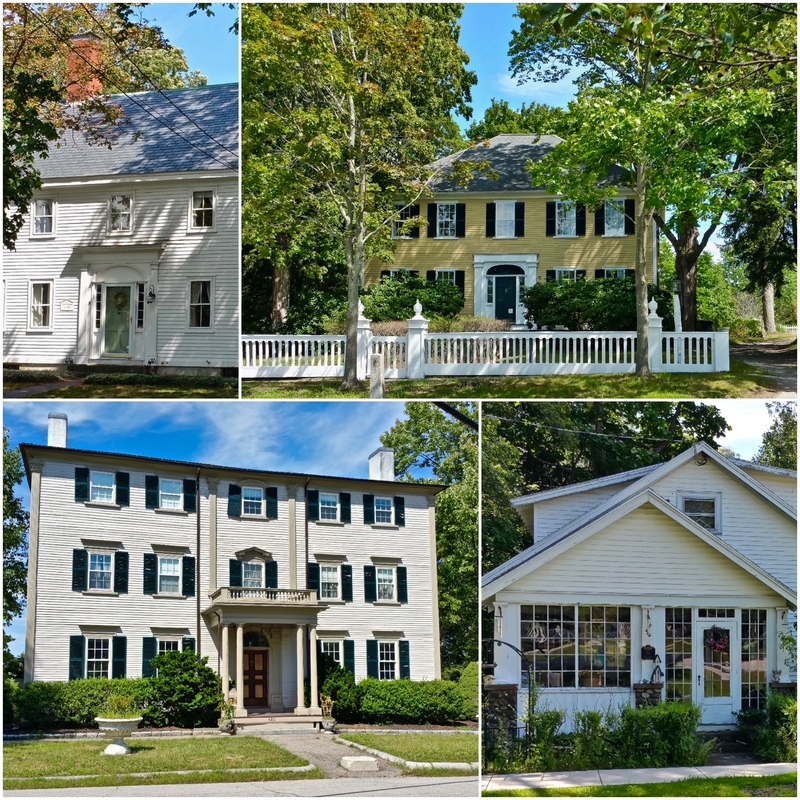 Here are some doors, residential and historic, from Post Road in the small town of Greenland, New Hampshire. In the early 1600’s, Greenland was a parish of Portsmouth but was incorporated in 1704. The current population is around 3,500. Greenland is a lovely little New England town with a wonderful greenhouse, Rolling Green Nursery. I just happened to be there yesterday picking up a hardy hibiscus so I decided to walk down Post Road and check out the doors. Plantscursion + doorscursion = fun afternoon. 🙂 Have a great Thursday. I’ll be in the garden finding a good spot for that hibiscus. As always Thursday Doors from all over the world can be found at Norm Frampton’s Thursday Doors, August 24, 2017. This entry was posted in New England, Photography, Thursday Doors and tagged Community Congregational Church, Greenland, Kopper King Hibiscus, New England homes, New Hampshire, Photography, Rolling Green Nursery, Thursday Doors, Weeks Public Library. Bookmark the permalink. These are the definition of New England, Judy. That small town charm that instantly takes you back in time. Good luck with the transplant. I almost killed one last year, moving it out of the way of my snow blowing path. But, it struggled to life and recently started blooming. I can’t make out what the “block” in the middle of the sidewalk is. Never saw that before. I would trip over it even knowing it’s there! I’m sure your new hibiscus will love its new home. Enjoy the wonderful weather we’re having. I was pretty sure it was a way to tell you to NOT use that door. I’ve seen a wide variety of attempts, including removing the walk entirely … and people STILL use that door. I just love those houses …. There is a definite New England personality .. Right down to the block in the pathway! Good luck planting your hibiscus, will it survive the cold? Oh, New England! Love your equation. I love these. The library is my favorite – beautiful detail on the double pediments, with the appropriate book shaped decal to announce its 1897 birth! The yellow home reminds me of my own – same style, picket fence, nestled in trees. I immediately felt at home looking at it! I wonder if hosta plants flourish there, alongside the door? So true. 🙂 I love light streaming in, but all those windows do need to be cleaned. At this point in my life, those upper floors get the windex bottle that attaches to my hose, and I call it good. I love that colonial architecture, and the porticoes of the church and library. I’d say it was a perfect day indeed! So many pretty buildings. I love your new “scursion” words. I’m looking forward to a cakescursion on the weekend with a dear friend. J > Wonderful pictures. I really must make it to New England sometime. The old buildings reflect an era of principled public-spiritedness. Oh, thank you! Just when I was thinking the world couldn’t get any more chaotic and insane, here come the order and balance of New England. Beautiful. 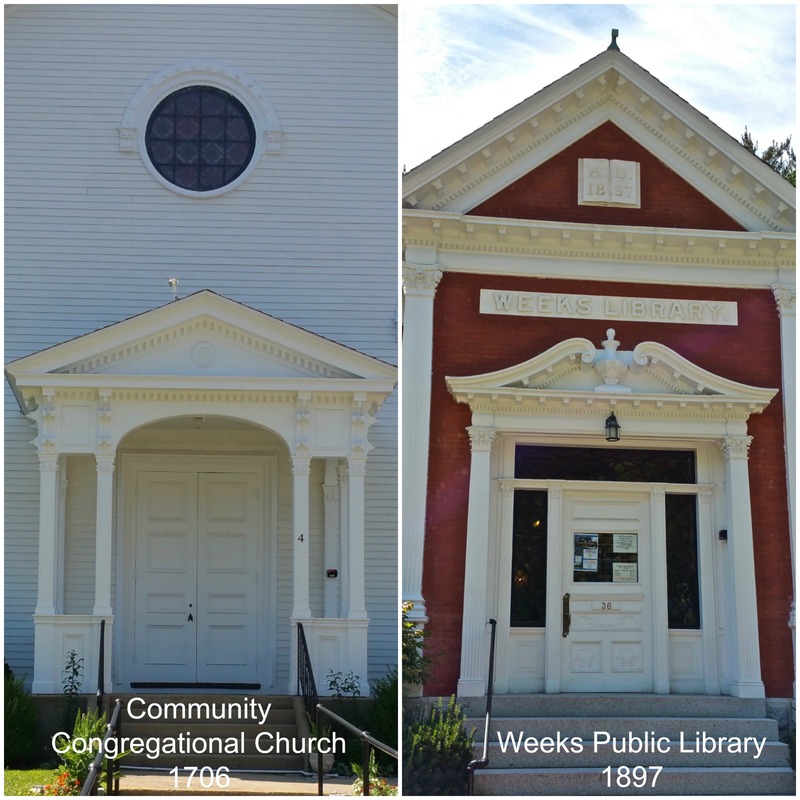 Small town libraries are the best–all these doors are so very Yankee! We were just laughing at our hibiscus last night–it looks like it belongs in Tahiti not in latitude 44! Looks like a charming town. The yellow house is lovely with white details, black shutters and white picket fence. I have always dreamed of a butter cream color home. The red building for the Weeks Public Library is unique and my very favorite one today! Plantscursion and doorscursion – who knew?! Love those old New England towns – one never has to say where they are, they have a personality that connot be mistaken for anywhere else! A stately yellow house + white fence + treed lot + soft shadows = LOVE! You always have such a nice collection of doors….